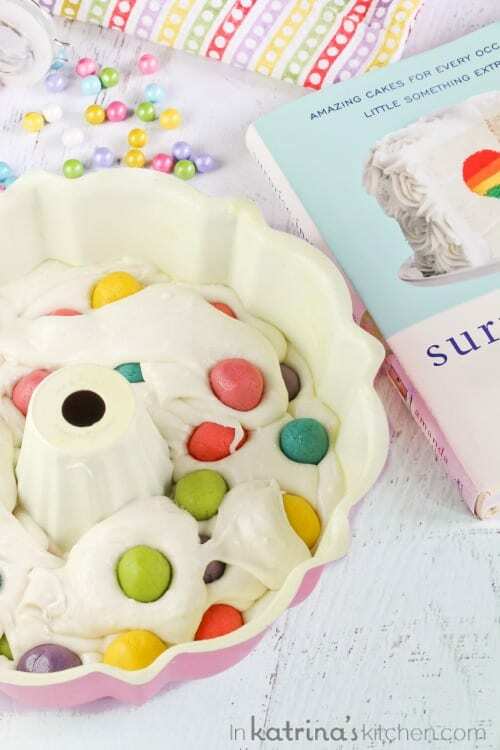 This Surprise-Inside Dotty Cake is SO easy and really will bring a smile to everyone’s face when you slice it open. 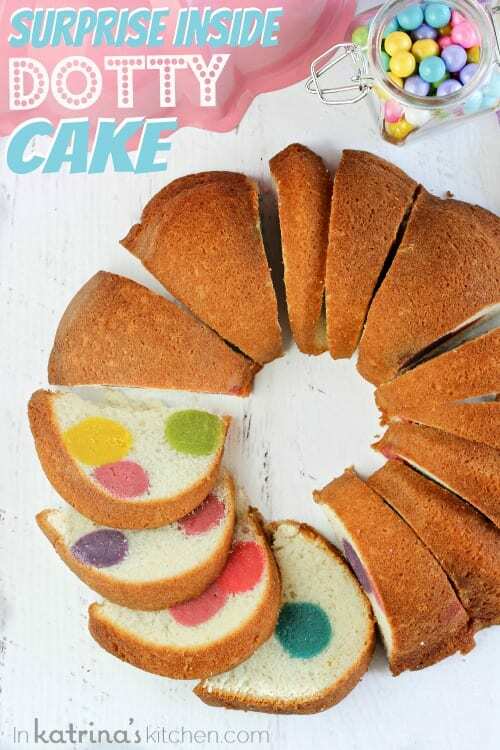 Try making a surprise-inside cake today! I’m so excited to be celebrating with my friend Amanda this week! 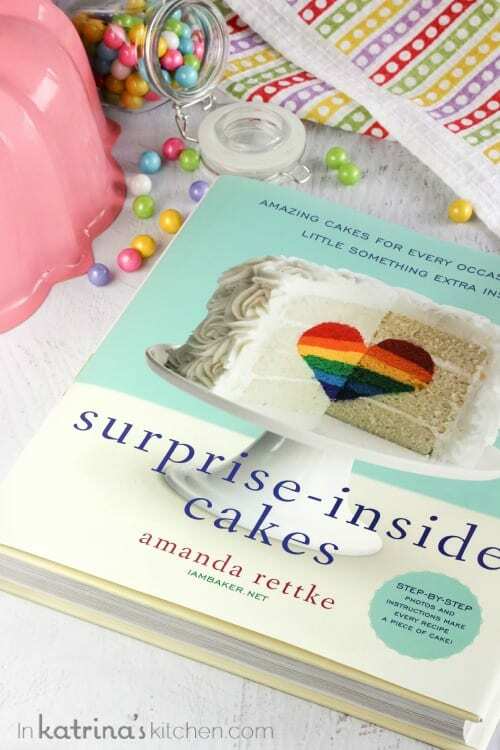 If you don’t know Amanda she is the founder of the wildly popular blog i am baker, and author of this beautiful cookbook Surprise-Inside Cakes: Amazing Cakes for Every Occasion–with a Little Something Extra Inside . I have read this book cover to cover, and I keep coming back to it. I was so inspired that I even made my own little surprise-inside cake. 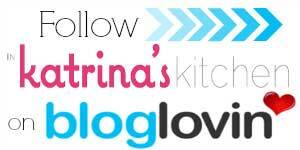 If you have ever been to Amanda’s blog you will see friendly, colorful polka dots all over. They even make an appearance all throughout her book as well. So Amanda, this cake is for you! I know many of you look at Amanda’s cakes and you may be completely overwhelmed. 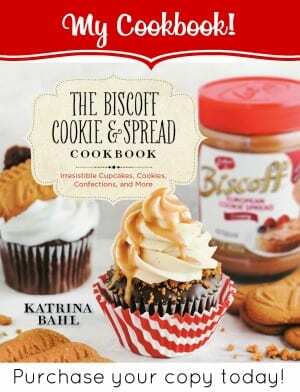 However in her book Amanda gives you the option to use her delicious recipes, box mixes, or you own family favorites. I really appreciate that about her book. 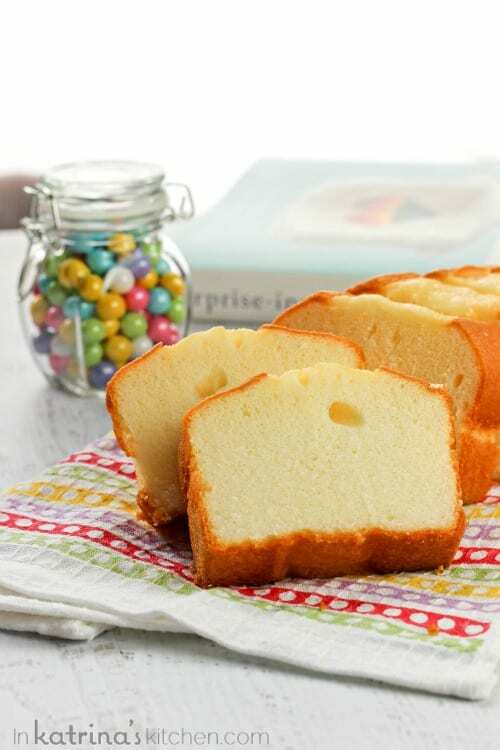 In this recipe I started with a store-bought pound cake loaf and finished with a box of white cake mix. Feel free to do what fits best with your schedule. You just cut up and cube the pound cake into 6 equal portions. 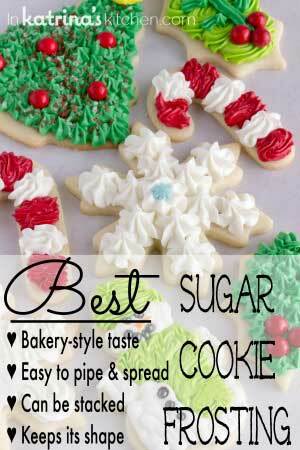 Add some frosting and a drop of food coloring to each section- be creative! Drop the cake balls into the batter. and bake as usual. That’s it! I told you it is pretty simple. 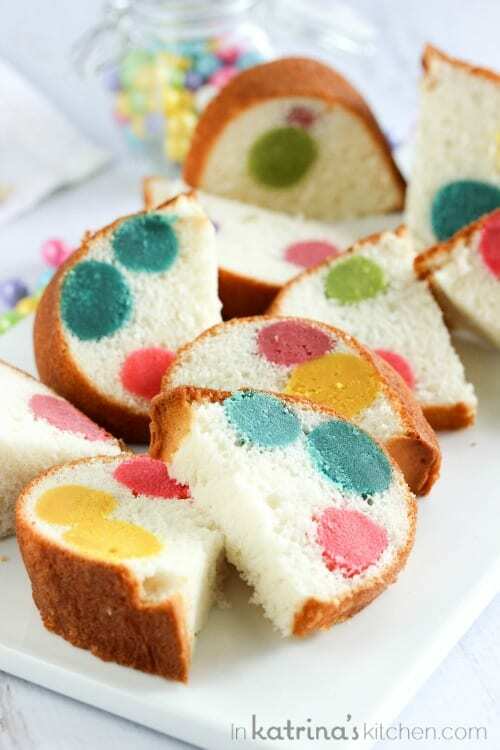 Get ready to surprise your guests with a whimsical dotty cake. My kids were both pretty excited to cut into this. I originally planned to drizzle it with a white frosting or glaze but I felt like the cake dots were sweet enough since they were made with crushed cake plus frosting. 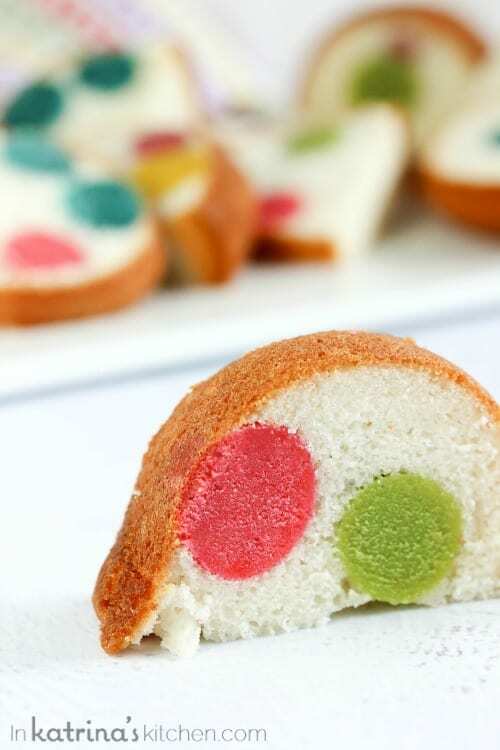 This Surprise-Inside Dotty Cake is SO easy and really will bring a smile to everyone's face when you slice it open. Try making a surprise-inside cake today! Place a slice of pound cake, 1 drop of food coloring, and 1 Tablespoon of frosting into your mixer or food processor. Pulse for 30 seconds. Repeat this step with 6 different colors. Use each color of batter to make approximately 6 cake balls (36 colored cake balls in total). Prepare your white cake according to package directions or according to your recipe. Pour a small amount into a well-greased Bundt pan. Drop a few cake balls into the batter. Continue layering the cake balls and batter. 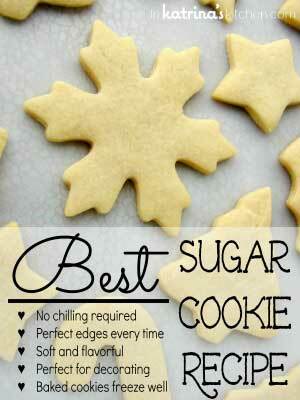 Bake according to package directions or recipe. Let cake cool completely before removing it from the pan. 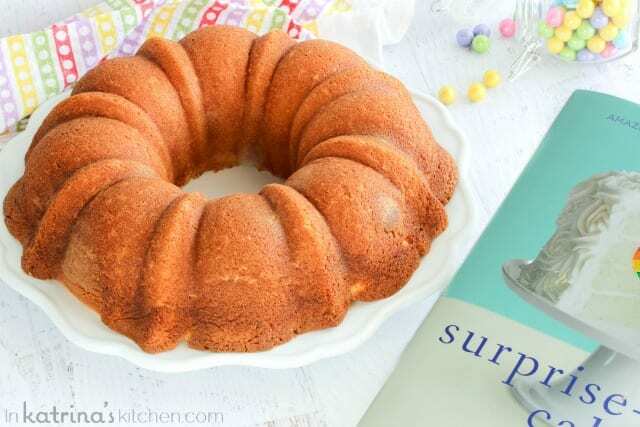 To remove the cake, place a large plate over the bundt pan and while holding the plate in place, invert the pan, the cake should drop unto the plate. I used a boxed white cake mix. You can try Amanda's Perfect White Cake recipe if you wish. My pan holds up to 12 Cups of batter. Check your pan capacity. When adding frosting to the pound cake to make cake balls, you may start with 1 teaspoon of frosting and work up to 1 Tablespoon. It will depend on the amount of cake you are using. You want a "dough" with a firm enough consistency to roll without sticking to your hands. Amanda always suggests cutting into a VERY COLD cake with a VERY HOT knife to get clean slices. I placed my (cooled) cake in the freezer for about 45 minutes and used a knife dipped in water and dried with a towel to cut the slices. This step isn't completely necessary for this cake but I do like how easy it was to get clean slices. I LOVE THIS!!! And you!!! So personalized and pretty and PERFECT!!! You are amazing!! Love it, so so so (so!) fun!! every time i see amanda’s book and everyone supporting her I just smile- what a great community. I am IN LOVE with this cake!! I want it! Amanda’s book is on its way to me – can’t wait to get my hands on it! What a lovely way to brighten up a simple cake! I love that you chose not to add frosting! That’s so awesome!! I love it- cutest cake ever! It turned out SO cute!!! Love it. What a super fun cake! Such a sweet cake, K! I’m loving how all those cute polka dots happened. So festive! Pinning! What a gorgeous cake – it would be perfect for a birthday party! Surprise indeed! Love all the fun bright colors. This is sure to bring out a lot of smiles. This is soooo cute, I can’t even deal! Need to make more cakes, especially for the grandchildren! Oh how cute! i would love to try and make marblized cake balls to put inside….thanks for the recipe! This is so cute and fun, I love it! Pinning for a fun summer activity with my kids! 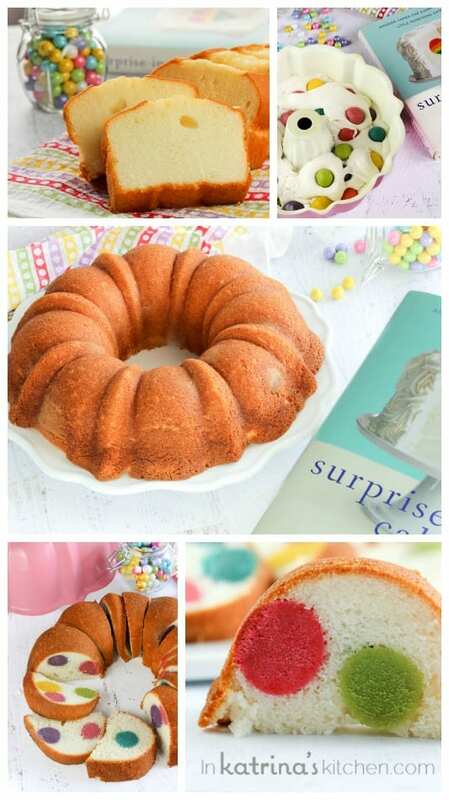 LUV HOW EASY THIS IS AND SOOOOOOOO VERSATILE TKS This would be great to fill with easter peeps also????????????? Lemon or coc. pound cake would be great with oreo cookie balls also. Have to put my thinking cap on now ha ha many ideas to choose from. This is such a fun cake. I would be so excited to get this cake. I love that!! That would be perfect for easter! I’ve been wanting to make something like this for a while, not I HAVE to! Look how beautiful and delicious! Sharing on fb today!!! Adorable! Which brand food coloring did you use? Do you think unsweetened kool aid could be used to color the cake balls and add some different flavors, or would it make the balls too tart tasting? Thank you so much for sharing this recipe and all the pictures. I made the cake this past weekend to celebrate my mom’s birthday and it came out PERFECT! I was so pleased with how easy it was and most importantly, how delicious it tasted. The cake ball “polka dots” were moist and sweet, even after being baked into the cake. 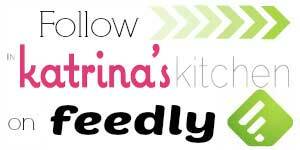 I will definitely use this recipe again as it was so easy to follow and can be easily tweaked with different colors and such. The most surprising part was that it really wasn’t as time consuming as I originally thought it might be when first reading the recipe. It was a little overwhelming, but once I got everything out and got going, I had all the cake balls done in about 15 or 20 minutes. Thank you SO much for stopping by and letting me know! I’m happy you and your mom enjoyed the surprise!! This cake looks so cute, i love it. I am going to try it this weekend. How can I get Amanda’s book? Is it in the stores or on Amazon? I live in Trinidad, hope i can get it here. Sorry, was so in love with the cake, wasn’t looking anywhere els. I can see the possibility of buying it on Amazon right here. Thank you. I love this cake very much!… But, I am still confused with the color of the ball. I live in Perth – Australia. So very cute. Do you think this would work baked in bread loaf pans? I want to mail to loved ones far away & it would be easier to shop this way. What kind of frosting do you use? The kind that hardens well or the cupcake softer kind? Thanks! I guess I get it, I was thrown off by the balls in the jar, I thought you used them. By the way Michael’s had colored balls, but not sure what they are for. That is also what threw me. You use the pound cake and make the balls? Correct?